HP Deskjet 3630 is an all-in-one device with a lightweight body and decent overall performance which can satisfy the requirements of home users. The printer offers some of the very basic features within the cheap upfront price it offers. To begin with, the device weighs just 4.1 kg with dimensions 17.2 x 12.2 x 6.2 inch in width, depth and height respectively. The maximum print resolution corresponds to up to 1200 x 1200 dpi for black and 1200 x 2400 dpi for colour. Print speed for black and white goes up to 20 ppm and for colour 16 ppm which can be accepted as good speed. Additionally, the printer supports borderless printing with a paper input capacity of 60 sheets and monthly duty cycle of 1000 sheets. The printer allows to print via cable using the USB or just wirelessly with WiFi networks and WiFi direct while connecting to any mobile device directly. It also features a small LCD screen. HP Deskjet 3630 all-in-one ink cartridges add to the high-quality text and photo printing. The device is compatible with Windows and Mac PC. Considering the cheap price of printer it offers reasonably decent features with good quality printing, scanning and copying. With the kind of features it offers, it makes a perfect choice for home and very small office users who print less than 100 pages a month. Although the HP Deskjet 3630 all-in-one ink cartridges are pricey they can be replaced with premium quality yet cost-effective compatible ink cartridges. With lack of some of the important features like fax, ADF and automatic duplexing, it may not suit even a moderately working office environment. How to remove the paper jam from the HP Deskjet 3630 All-In-One ink cartridge access area? The paper jam can happen in any part of the printer area. Try to clear the paper jam automatically by pressing the cancel button. Turn the printer off, and detach the USB cable from the printer. Also, disconnect the power cord from the printer before reaching inside the printer to prevent yourself from any kind of injuries or electric shock. Close the output tray extender, and push the output tray into the printer. Open both the exterior door and HP Deskjet 3630 All-In-One ink cartridge access door. The print carriage should be present at the right side of the printer. If not, then move the carriage slightly towards the right side of the printer. Close the exterior door and HP Deskjet 3630 All-In-One ink cartridge access door after you remove the paper jammed inside the printer. Once, the jammed paper is removed, step out the output tray and the output tray extender from the printer. Connect the power cord and the USB cable (if necessary), to the rear of the printer. At last, press the power button and start your HP Deskjet 3630 All-In-One printer again. How to clean the paper feed rollers inside HP Deskjet 3630 All-In-One printer? Turn on your HP Deskjet 3630 All-In-One printer and remove all the papers available inside the input tray. 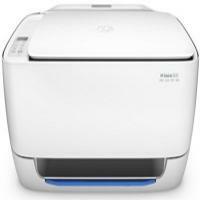 After the HP Deskjet 3630 All-In-One printer stops making noise, resume your printing process. Q. Will ink cartridges turn unfit for use if they remain out of the printer for 10 minutes? A. You need to avoid keeping ink cartridges exposed to open air for long. They should not be out of the packing or the printer for more than 30 minutes. Q. Is it okay to dismantle printer cartridges? I thought of dismantling HP Deskjet 3630 All-In-One ink cartridges but my colleagues advised me against it. A. Please do not dismantle ink cartridges as it can damage the print head due to which you will not be able to use your printer. Q. Do you deliver products on Sundays? A. No, sorry, we are unable to deliver on Sundays. We deliver on business days (Monday to Friday). We can offer 1-2 days business delivery, so if you have an urgent requirement, please place your order accordingly. Q. Would you recommend compatible HP Deskjet 3630 All-In-One ink cartridges for professional quality printing jobs or are they better only for home use? A. These ink cartridges yield excellent quality printouts. You can certainly use them for professional purposes and be sure of great results that will delight you. Q. I placed an order for wrong ink cartridges in place of HP Deskjet 3630 All-In-One ink cartridges. Can I send them back to you and get a refund? A. Yes, please return the ink cartridges to us within 30 days; if they are in original packaging, unused and good enough to be re-saleable, we will definitely offer you a refund for it. Q. I need to print text frequently for my work. Do you have a set of HP Deskjet 3630 All-In-One ink cartridges handy that can be sent immediately? A. We usually have a sufficient number of items in our stock but in case we don’t have what you require, we will contact you and inform you promptly about the delay in procuring your product.